As much as I love Cleveland, I love traveling down 71 to see old friends. Friday night was spent in Wooster, partly to make sure I wouldn’t be borrowing a friend’s couch to sleep, but also to help break down the drive. I woke up Saturday and did a short run to shake out my legs, trying not to blow away I headed around Route 83, dodging cars, and quickly found a housing development. I heard my knee pop just as I turned onto the sidewalk. Immediately I thought, this couldn’t happen, after taking two weeks off and being careful, I couldn’t bare starting the pain all over the day before the race. I slowed down and turned back. Luckily it was just a pop and some small pain. By the time I got back, it felt like nothing happened. Hopefully this was just my body’s way of telling me to be careful this weekend. The drive from Wooster to Columbus felt like forever, probably because I was so excited to get to the expo! I was even more excited that Darren would get to experience it, and maybe it would make him want to be a runner…. (wishful thinking). I got my number, pretty cool shirt and race bag, then I was off to see what I could find that “I had to add to my running closet” After spending more than I should have, and spending more than enough time, we were off to watch the Buckeyes at Eddie George’s. She stayed for the first half, and then left me in charge of Darren’s friends. 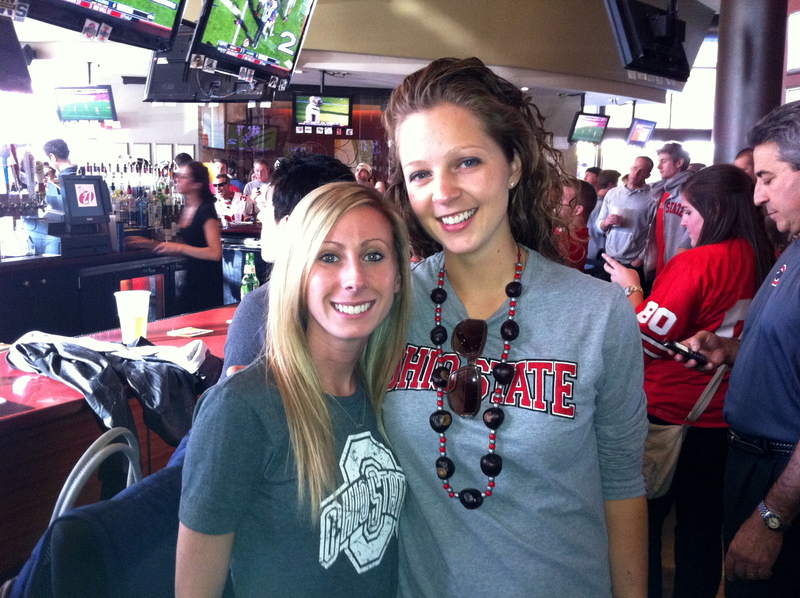 Let’s just say that being the only sober person in a bar during a Buckeye game, isn’t always fun. 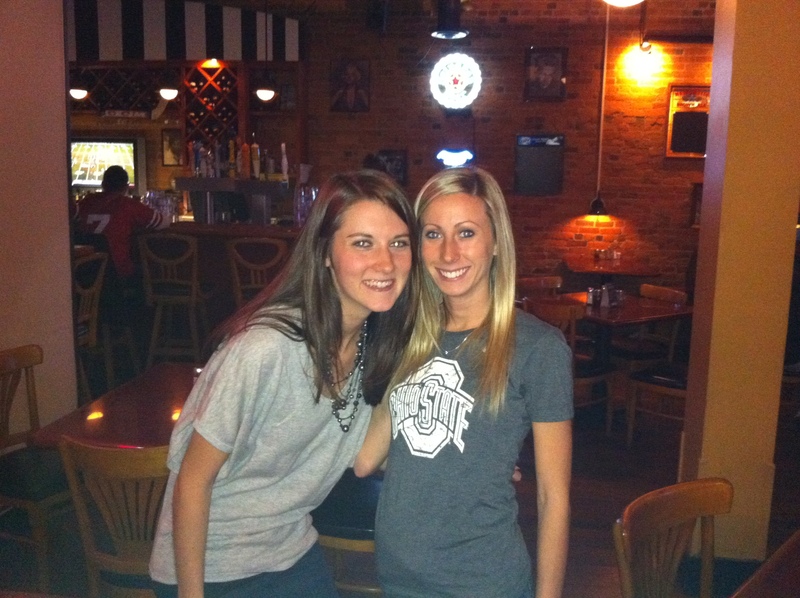 But OSU won, so it was a great start to the weekend! Laying in bed, my mind was all over the place. I don’t know Columbus that well, I wasn’t even sure how to get to the start of the race, or even where good parking garages would be. I wasn’t familiar with any of the race course, so I had no idea what to expect for the course. I had trouble sleeping because I was so worried about getting lost, but I could have easily overslept had I really wanted to. I was still really unsure as I was getting ready in the morning. 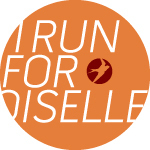 I was so excited that a number of friends would be running their first half/full marathon. But my excitement quickly diminished for my own race. My stomach was a mess and I was undecided on long sleeve or short sleeve all morning. Stresses I didn’t need. On my way to drop off my bag, I found Sarah, a friend from high school who was running her first. She was so excited and nervous, everything I had felt 5 months before, getting ready for Cleveland. I wished her good luck and was about ready to start. I barely fit on the street, but started to get excited as the fireworks went off and the race began. Within the first half mile, I was already regretting running. I was thinking of ways I could get out of the race, trying to convince myself it wouldn’t be my day. Right as I wanted to turn off I felt an arm around me. Who is hugging me in the middle of the race? It was my aunt! We ran together for a few minutes, got my mind off everything and she sped up to do her own race. The miles went on and soon I decided I needed to take a bathroom break. Waited in line for 2-3 minutes, then I was back on the road. My stomach was in bad shape and I could feel my legs slowly deteriating. The only thing getting me through was knowing I’d be a fanatic at the end. I was still keeping my normal 10:00 minute pace, but there was no way I’d be able to negative split on any miles. By mile 7 I was growing thin, my stomach was growling, cramping and on the verge of losing the Cliff bar I had in my stomach. This was about the time that the volunteers were handing out some sort of energy gel. I grabbed one. I figured nothing else could go wrong, so I might as well try one. Thinking in the bad of my mind, never try something new on race day, I figured it was worth a short, anything to help me through the race. Slowly but surely, I started feeling better and had some energy. My legs were still sore, but I was feeling better. Thinking back, I should have put more IcyHot on to block out all pain. Around German Village I remember Elayna said she would be there to support me, I tried to find her, but unfortunately couldn’t spot her. She later told me she found me and that I looked great. Two miles left and I hit my usual wall, not as hard, but my time was definitely slowing down. From then on it was just a solid line of fans on both sides cheering and pushing everyone to get to the finish. I don’t remember much of this part, but for the first time I knew I was going to make it. When I saw the sign that told the half marathoners to split off, I started to speed up, increasing my stride and opening up my legs, I was just seconds of finishing. And that moment never felt so good. With everything against me I made it at 2:17:38, just 2 minutes off my PR (Shouldn’t have taken that bathroom break) My greatest feeling was that I was finally a fanatic. I had worked hard to get to this point, and I could smile through the pain. So here I am, Half Fanatic #1441. My toughest race to get to this accomplishment. And even though it was a horrible race, it made me stronger. I was 90% mentally not in the race, but somehow I made it through, had some firsts, and wasn’t far off my regular pace. Even bad races can be good. After I got myself steady I got a much needed massage, watched the finish and waited to see a fellow Muskie come across the finish line. I was already on the verge of tears after watching little kids squeeze through the fence to finish with their parents and saw a man being helped to the finish after his legs gave out 500 feet from the line. 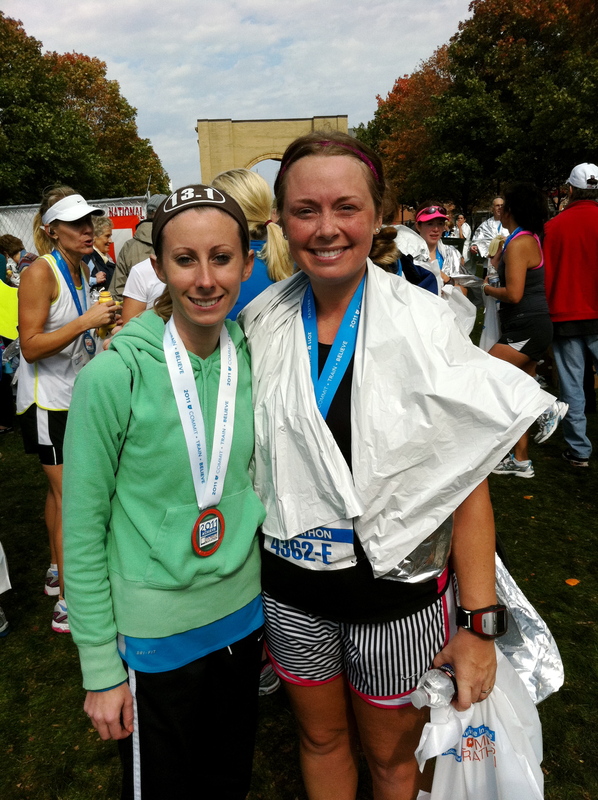 So watching Kimi finish her first marathon, I was completely overwhelmed. Even the guy next to me was excited for her. So proud she had an amazing race! 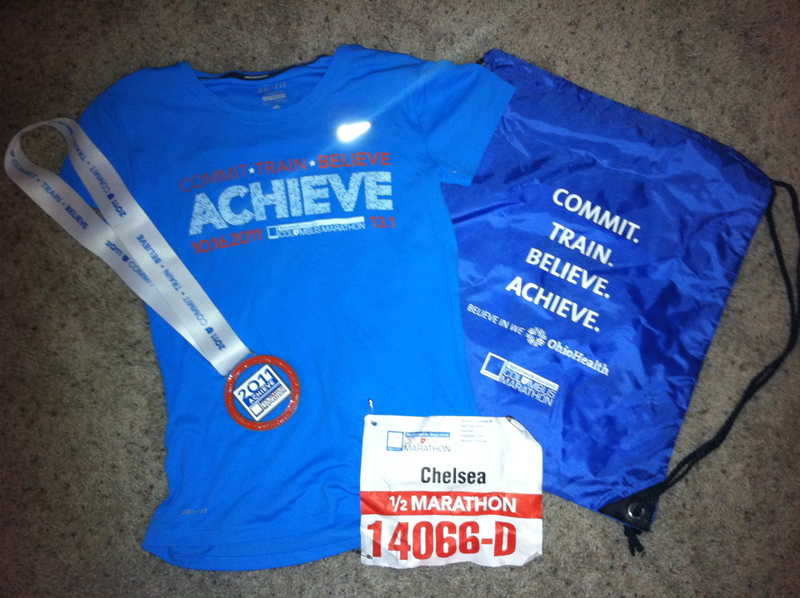 Oh and hey back 13.1……I’ll see you next year! Way to tough it out mentally and run a great race! You are going to dominate 26.2 next year! Thanks again for cheering me on, it was so awesome to see you at the finish!!! Great job on pushing through!! Congrats on becoming a half fanatic! Love the race swag shirt, you are the first person that I have seen post it. I swear 90% of a race is mental. I think it’s the hardest part of running and/or racing. Way to push through it and finish!! Congrats!